Three of the International Space Station's crew members have returned safely to Earth, ending their six-month orbital mission. A Russian Soyuz capsule carrying NASA astronaut Rick Mastracchio, Japanese spaceflier Koichi Wakata and Russian cosmonaut Mikhail Tyurin landed on the steppes of Kazakhstan at 9:58 p.m. ET Tuesday (7:58 a.m. local time Wednesday). "What an exciting time we shared in this increment," Wakata, Expedition 39's commander, said on Monday as he handed the station's reins over to NASA astronaut Steve Swanson. 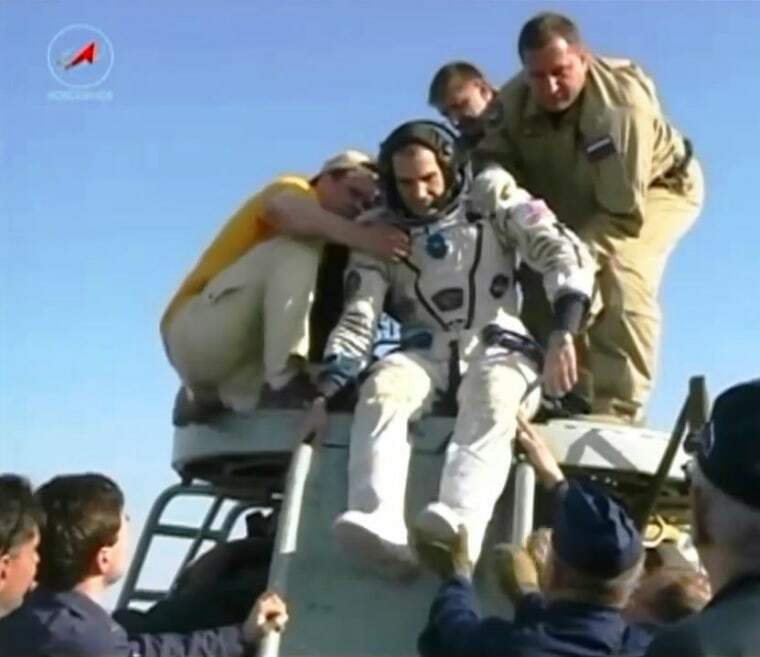 "Congratulations, and best wishes to the crew of Expedition 40 for a successful mission." Wakata, Mastracchio and Tyurin enjoyed an eventful and historic stint in orbit after arriving at the space station on Nov. 7, 2013. Wakata became the first Japanese citizen ever to command the station when he took charge of Expedition 39 on March 10. Wakata, Mastracchio and Tyurin zipped around Earth 3,000 times during their 188 days in space, traveling more than 78 million miles (127 million kilometers), NASA officials said. Expedition 40 will start with a skeleton crew that includes Swanson as well as Russian cosmonauts Alexander Skvortsov and Oleg Artemyev. But the space station will soon be up to full strength once again. Three new crew members — NASA's Reid Wiseman, Russia's Max Suraev and Germany's Alexander Gerst — are slated to blast off from Baikonur Cosmodrome in Kazakhstan on May 28. This is a condensed version of a report from Space.com. Read the full report. Follow Mike Wall on Twitter and Google+. Follow Space.com on Twitter, Facebook or Google+. Quiz: Do You Know the International Space Station?